Orthodox Church liturgical Deacon clergy vestments by Istok Church Supplies Corp.
Istok Church Supplies offers a comprehensive range of quality Deacon liturgical clergy supplies at low prices. Our Deacon vestments are available in many brocade and color options. Each set includes well matched sticharion (robe), orarion (stole) and epimanika (cuffs). Symbolic of a Deacon’s post in the Orthodox clergy hierarchy, our elegant vestments are just right for reminding the wearer and onlookers about the grace of God. The brocade material does much to enhance the beauty and significance of the vestment garment. We offer vestments in metallic brocade, rayon brocade, Chinese silk, linen and velvet – all of which look magnificent and stunning. We realize and appreciate that the function of a Deacon is to lead prayers and serve the community. We also understand that the Deacon must be properly attired for all liturgical services. We take extreme care to ensure that the Orthodox Deacon vestments for sale we offer comply with the canons of age old traditions. 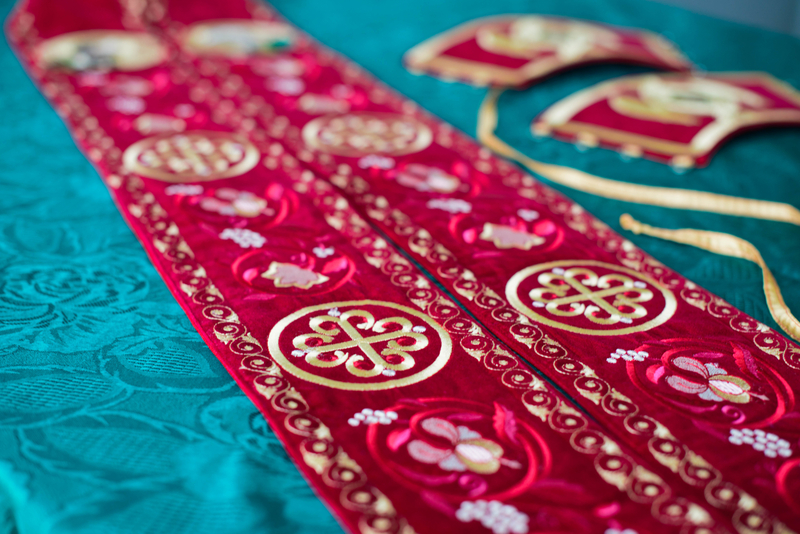 Our vestments are manufactured using the best quality fabrics and quality workmanship. The Deacon vestment is symbolic of the spiritual joy that springs forth from the person who wears it. Whether you want the vestment to be simple or prefer to have rich embroidery on it, we can cater to your requirements. In case you do not need the robe or cuffs, you can place your order only for the orarion. We provide our customers with options for fabric, colors, and patterns to ensure complete satisfaction. Please take the time to select your preferences from the list of options and specify all your requirements in the Notes field of your order. Once you send us your exact measurements as per our Measurements chart, we will start working to ensure the perfect fit. Although we do offer Orthodox Deacon vestments for sale at marked down prices, you can make further cost savings by ordering in large volumes.